Hello and welcome to our live coverage of stage 3 of the Vuelta a San Juan. 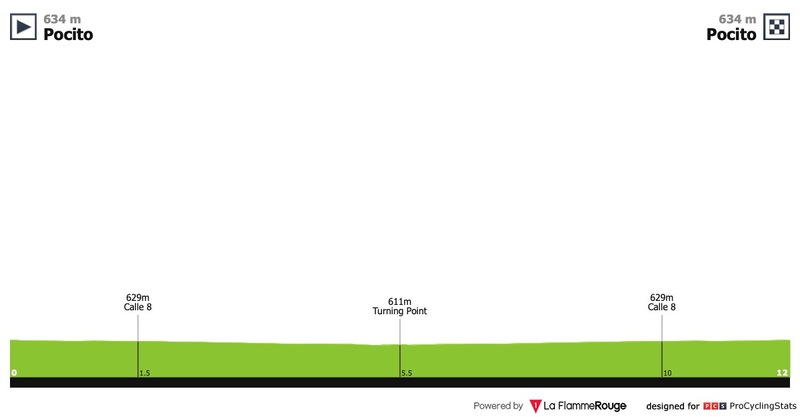 It's a 12km time trial around Pocito today, meaning we'll see a shakeup of the general classification tonight. The first couple of riders have set off. They're heading out in reverse GC order, of course, with the leading riders set to head out on their runs in around two and a half hours. Mark Cavendish is set to start his ride in a few minutes' time. He's the biggest name among the early runners, which mostly consists of riders from South American Continental and national teams. Former Hour Record holder Matthias Brändle has just set off. He'll likely be in the hot seat in a few minutes' time. Brändle is among the favourites to win the whole stage, in fact. Other strong time trialists on the startlist include Julian Alaphilippe (Deceuninck-Quick Step) and Tom Bohli (UAE Team Emirates). Yesterday's stage 2 was shortened by 30km due to the high temperatures of around 40°C. Today the riders are enduring similar heat - Dimension Data are reporting a temperature of 42°C. Matthias Brändle (Israel Cycling Academy) crosses the line with a time of approximately 14:29. Brändle is in fact the fastest man so far. His time was 14:28.9. Mark Cavendish is the latest rider to cross the line. He's ninth fastest, with a time of 16:15.1. Jose Martinez (Argentina) is the only man to get within a minute of Brändle's time. He's 43 seconds back in second place. Tom Bohli has just started his run. He's a strong enough time trialist to challenge Brändle's time. Bohli is riding a regular road bike today, with not even clip-on aero bars for assistance. It's the same story for every rider we've seen so far, including Brändle. He does have a rear disc wheel though, along with an aero helmet and skinsuit. Bohli goes fastest, with a time of 14:09.9. That's 19 seconds quicker than Brändle. Stan Dewulf (Lotto-Soudal) is another man who has come close at the top of leaderboard. His time of 14:56 is 47 seconds down on Bohli. Dimension Data's Rasmus Tiller lies third overall behind Bohli and Brändle. Meanwhile, Alvaro Hodeg (Deceuninck-Quick Step) sets off. Hodeg rounds the only corner of the course, midway through. It's an out-and-back route, nothing fancy. Nairo's brother, Dayer Quintana is out on course now. It's his first race for his new team Neri Sottoli-Selle Italia. Hodeg set the fourth-fastest time, 41 seconds down on Bohli. No change at the top as we get closer to the sharp end of proceedings. The top ten are separated by 54 seconds, with Bernhard Eisel (Dimension Data) lying tenth. Conor Dunne (Israel Cycling Academy) has gone second fastest. He finished just five seconds shy of Bohli's time. Nairo Quintana (Movistar) sets off. 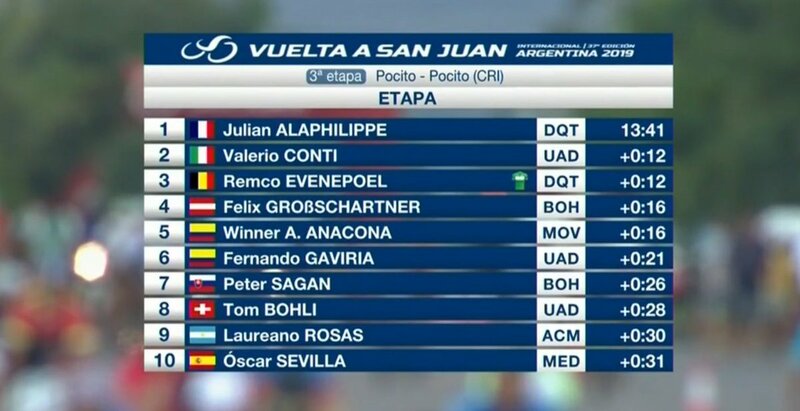 He lies 18th overall, 13 seconds down on compatriot Gaviria. Matteo Cattaneo (Androni Giocattoli-Sidermec) has put in a fast time to go fourth. He completed the course in 14:32.3. Remco Evenepoel (Deceuninck-Quick Step) follows Oscar Sevilla (Medellin) down the ramp. Just the 23 years age difference between the two. Felix Großschartner (Bora-Hansgrohe) has gone fastest. His time of 13:57.2 is 12 seconds faster than Bohli. Sevilla was fast too. The 42-year-old came in third fastest. Evenepoel has bettered his elder though, as well as everybody else who has already finished. The 19-year old goes fastest with a time of 13:53.9. Felix Großschartner and Winner Anacona are in second and third at the moment, four seconds down. Bohli is fourth at 16 seconds. Valerio Conti (UAE Team Emirates) has edged out Evenepoel by less than a second for provisional first. Overall leader Fernando Gaviria is out on course now. He's wearing his team aero skinsuit rather than the GC leader's jersey though. Julian Alaphilippe is flying as he heads into the final kilometre. Alaphilippe finishes with a time of 13:41.1 to go fastest! 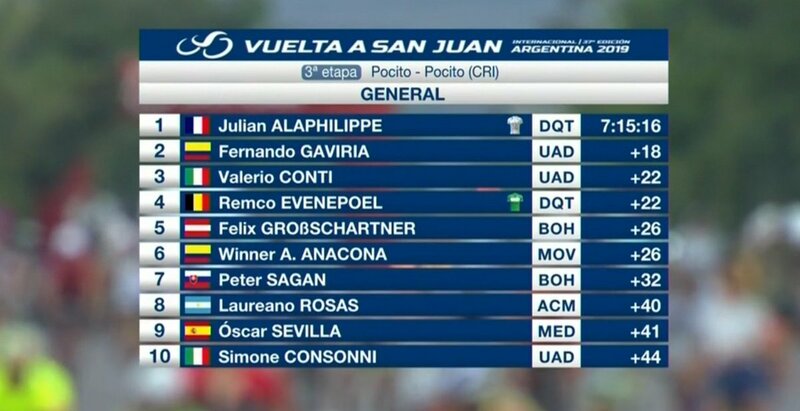 He smashed Conti's time and should take the overall lead now. Gaviria finishes 21 seconds down to take sixth. Alaphilippe is the new leader. Here's the the stage result and GC standings. And that's it for today. We'll be back tomorrow for stage 4, a185.8km flat stage from San José de Jáchal Valle Fértil to Villa San Agustín.